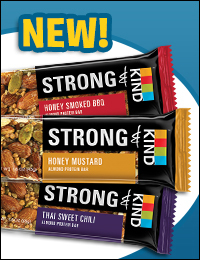 STRONG & KIND Almond Protein Bars - Scoot over, dessert-flavored snack bars... Savory grab-n-go bars are coming to town! In Hickory Smoked, Roasted Jalapeño, Honey Mustard, Thai Sweet Chili, and Honey Smoked BBQ, each bar has 230 calories, 16g fat, 115 - 140mg sodium, 15g carbs, 3g fiber, 6g sugars, and 10g protein (PointsPlus® value 6*). Not bad, considering that protein count. Currently at Sprouts, HEB, Roundy's, GiantEagle, Wakefern (ShopRite), A&P, Ahold, and Fairway (and online ) -- coming soon to Target and Walmart locations. UPDATE: Click for recall info (may contain peanut protein). Pirate's Booty Macaroni and Cheese Dinners - From the folks who brought us iconic snack puffs, check out these cheesy mac offerings! They're made with organic pasta and real cheese but without artificial colors, flavors, and preservatives. In varieties like Mac & Cheese Mild Cheddar and adorable Anchors & Cheese Aged White Cheddar, each serving (unprepared) has 250 calories, 2 - 3g fat, 530 - 560mg sodium, 46 - 47g carbs, 1g fiber, 5 - 6g sugars, and 9 - 10g protein (PointsPlus® value 6 - 7*). Make 'em with light butter and fat-free milk to keep the calories and fat down; then add veggies for extra fiber! Now in Target, Stop & Shop, and Giant stores, and hitting more markets in June. Peeps Minis - The Peeps they are a changin'... These newbies are little and therefore lower in calories than the originals, with just 13 - 14 calories each. Hooray! Choose from Sour Watermelon, Chocolate Crème, Vanilla Crème, and Strawberry Crème. Each 10-chick serving has 130 - 140 calories, 0g fat, 5 - 15mg sodium, 31 - 34g carbs, 0g fiber, 27 - 31g sugars, and 1g protein (PointsPlus® value 3 - 4*). Not bad for a once-in-a-while sweet fix! Find 'em in the candy aisle at retailers nationwide -- the Vanilla Crème is exclusively at Target. Panera Bread Does It Again: Guilt-Free Menu News! The Flatbreads: Panera has entered the flatbread game! When it comes to the folded sandwiches, your options are Mediterranean Chicken (290 calories, 10g fat, PointsPlus® value 7*), Thai Chicken (280 calories, 10g fat, PointsPlus® value 7*), and Southwestern Chicken (360 calories, 17g fat, PointsPlus® value 9*). Plus, a BBQ Chicken Flatbread is coming in July! The Egg White, Avocado & Spinach Breakfast Power Sandwich: Enjoy the bagel flat as a part of this new power meal! With white cheddar, tomato, and all the delicious ingredients in the sandwich's name, the b-fast item has 410 calories and 14g fat (PointsPlus® value 11*). The Returning Favorites: A couple of seasonal selections are back in the lineup -- Low-Fat Lemon Chicken Orzo Soup (180 calories, 4.5g fat, PointsPlus® value 4*) and Strawberry Poppyseed & Chicken Salad (350 calories, 13g fat, PointsPlus® value 9*). We'll take both, thankyouverymuch. P.S. Check out our Panera Bread Survival Guide... So much good stuff! The Latest Flash in the Pan(era)! But NOT Lesser -- Bacons! It's hard being overshadowed by a sibling, whether that sibling is Kevin Bacon, or, you know, pork bacon. Their brothers could use a little PR, dontcha think? 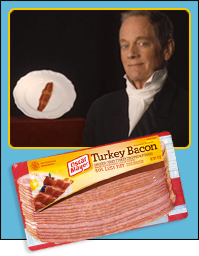 Michael Bacon and turkey bacon each get their props in this new Oscar Mayer commercial -- watch it! And let's help Michael reach his Twitter goal, K?! ***Speaking of being overshadowed by bacon... Panda Express recently announced a bacon-enhanced version of its Orange Chicken (spoiler alert: it's a 510-calorie diet disaster! ), but we're way more interested in the brand-new Shiitake Kale Chicken Breast. Mmmm! A serving of the veggie-chicken dish has just 170 calories and 8g fat (PointsPlus® value 4*). ***Ever wonder which leftover ingredients can be successfully frozen and thawed? Check out this fantastic guide from HG pal and partner About.com. Learn how to freeze things like eggs (in an ice cube tray), bananas (in the peel), herbs (also in an ice cube tray), and more. ***Alright, one more funny video story before we send you back to the real world. Did you see Tiny Hamsters Eating Tiny Burritos? They're not alone... Here's a whole bunch of videos where teensy animals eat miniature foods. And that's all we've got. HG out! You know your pals would LOVE the Panera news and that bacon video... Click "Send to a Friend" now. It's National Devil's Food Cake Day, May 19th. We LOVE the stuff -- click here for a ton of recipes.